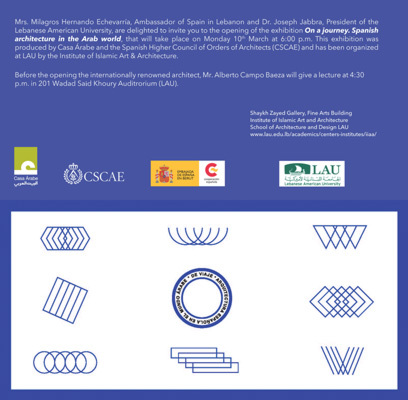 The Institute of Islamic Art and Architecture, in collaboration with the Spanish Embassy in Lebanon, is organizing an exhibition entitled “On a Journey: Spanish Architecture in the Arab World”. This exhibition was produced by Casa Árabe and the Spanish Higher Order of Councils of Architects. Prior to the opening, a lecture by the well-known Spanish architect Mr. Alberto Campo Baeza will take place. For more information, click here. The exhibition will run until the end of March at the Shaikh Zayed gallery, Monday to Friday from 2 P.M. to 6 P.M. Visitors are advised to call LAU at 01-786456, ext. 1372 for individual and group visits.